You’ve finally gotten your wellness routine locked down, but vacation is coming. It’s coming for your wellness routine. Vacation is supposed be your time to relax and enjoy time away from routine. 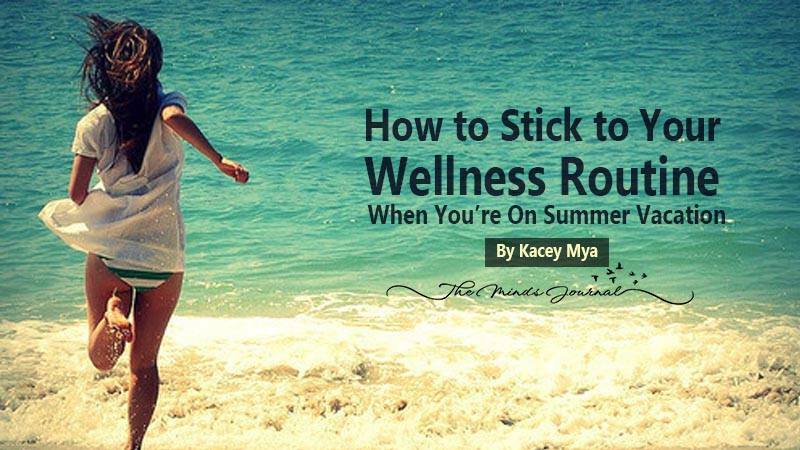 Your wellness routine is one that you want to hang onto. Yet, it’ll be challenging. You will be faced with temptations as you eat out, are offered drinks and generally disregard how far you’ve come on your wellness journey. How do you relax, allow yourself room to indulge and remain on track with your wellness routine? Don’t worry, because here’s some advice to keep you on your path. Choose red wine over white wine. Red wine has more antioxidants and is beneficial to heart health. Red wine is also a better source of magnesium, potassium and iron. Choose whiskey neat or on the rocks, instead of a cocktail. Cocktails tend to have more calories. If you stick to one liquor and keep it simple, you have less caloric intake and less worry about a hangover the next day. Set a limit to your drinking. Drink only one or two drinks, and make sure that it fits in with your routine as an indulgence. You’ll need to drink more water, and adjust your diet to better process the alcohol. Hummus dip and cucumbers, pita chips and carrots to scoop. Using different scooping fruits and vegetables adds variety and is more nutritious. Guacamole and corn chips. Avocado is a healthy fat! Peanut butter and apple slices. Get that protein boost! Trail mix with dark chocolate, which helps with heart health. Sandwich wraps can be convenient and nutritious with the right ingredients. Homemade dried fruits and vegetables. Make your own jerky, too. You will need a dehydrator, or set your oven on a low temperature to dry out food items for several hours. The key is to mostly focus on meals and snacks with fiber that help break down food more quickly within the digestive system. Don’t be a glutton. Easier said than done, right? Your friend will probably order a juicy steak and potatoes with fancy garnishes. Translate fancy mouth-watering dish names into plain English, or Pig Latin, whichever floats your wellness boat. Grilled salmon with a cucumber-lime dressing on a bed of rice, garnished with cilantro and a side of sautéed spinach becomes fish on rice with fruity sauce on top, with green stuff. A little humor will help distract you from temptation. Again, choose meals with fiber for easy digestion. Choose entrees that fit within your wellness goals and dietary needs. Stick to your regular workout routine, as closely as possible. If you have a wake up or before bed yoga routine, keep practicing it at the same times. Exercise while on-the-go. While there have been routines developed to exercise the body while at work, you can also utilize such routines while out and about on vacation. Take the stairs over the elevator. Bike around town to attractions, instead of taking a tour bus.